This frame border helps to bring out the colors of this painting, I like the darker outside edge. 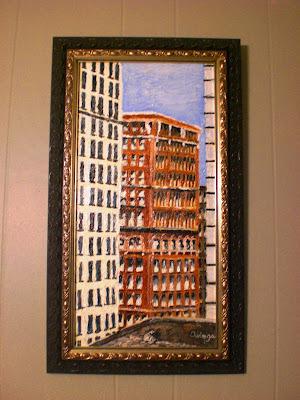 To see this painting in its unframed condition, scroll down on the site. Comments on this frame choice are welcome. This frame goes very well with this painting. The oval shapes in the gold of the frame go along well with the shapes of the windows. This frame looks like it was made for this painting!